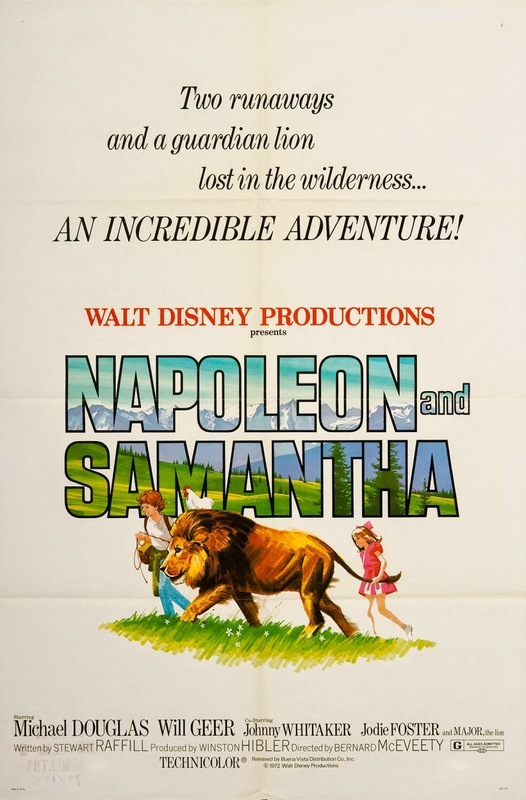 Cute kids and animals were a hallmark of live-action Disney films and at first glance Napoleon and Samantha looks like just another in a long list. However, Disney was prepared to break a few conventions with this latest endeavor. Rather than a cute comedy, this film is far more serious and deals with heavier themes. 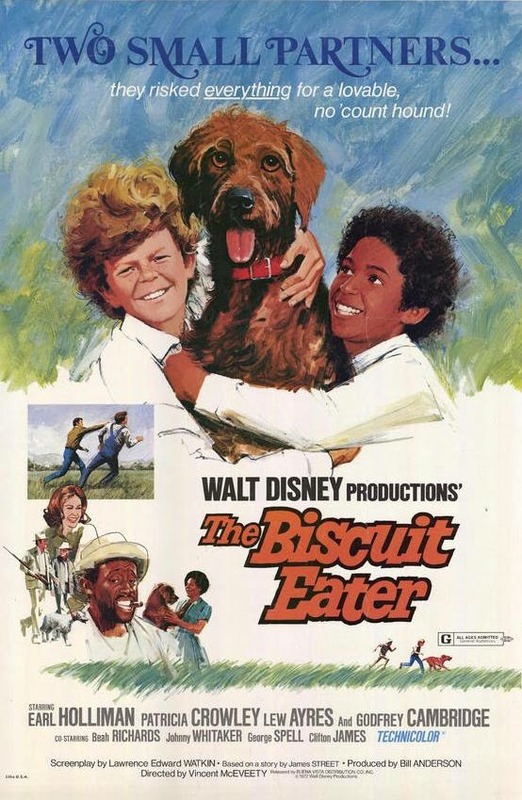 Johnny Whitaker returned as the lead for his second Disney film, the first one being The Biscuit Eater. Jodi Foster makes her feature film debut here, a freckle-faced 9-year old who'd been working on TV since she was 4. This was her first of four Disney films that she would make in the 70's. Michael Douglas (son of Kirk Douglas from 20,000 Leagues Under the Sea) became a household name this same year on the TV series The Streets of San Francisco. He plays a hippie in this, his only Disney film. However he did return to the studio for 2015's Marvel film Ant-Man. The lion was a star in his own-right. Zamba was 16-years old and 500 pounds when he made this film, but he'd been working in Hollywood since 1955 and appeared in a slew of Tarzan films and on many major TV shows, such as I Dream of Jeannie and Gilligan's Island. Mary Wickes also has a bit part in this. She was the live-action reference for Cruella DeVille in One Hundred and One Dalmatians and two of her most iconic roles would come later in Touchstone's Sister Act and Disney's animated version of The Hunchback of Notre Dame. John Lupton also returned for the first time since 1956's The Great Locomotive Chase. Producer Winston Hibler, who worked on the True-Life Adventure films and most of Disney's animal films, scouted the perfect filming locations in Oregon. The towns of John Day and Canyon City served as the civilized locations, with unsettled land serving as the wilderness the children trek through with their lion. TV director Bernard McEveety was assigned to this, his first of several Disney films and TV movies. The film opens with a stylized credit sequence with moments from the film depicted in felt cutouts. Napoleon and Samantha are kids in a small town who make money selling bottles they find. When Napoleon and his grandpa, his caregiver, happen upon a retired circus clown they agree to take his tame lion Major into their care. When his grandpa passes away, Napoleon keeps his death a secret out of fear of ending up in an orphanage. He hires an out-of-work young man named Danny to help him with a secret burial. When his only living relative, an uncle in New York, doesn't respond to the letter he sends, Napoleon and Major decide to embark on a multi-day hike to Danny's cabin with Samantha and her chicken along for the journey. Their adventure pits them against a mountain lion and a wild bear. Meanwhile, Samantha's babysitter discovers that she is missing and alerts the police, who discover Napoleon's grandfather's grave and begin a search for the missing children. They find Danny who returns to town to tell Samantha's sitter that she's alright, but she calls the cops and has Danny arrested for kidnapping. When the police refuse to go to his cabin to prove the kids are alright, Danny discovers that the man he left the kids with is a wanted man and breaks free, stealing a motorcycle and leading a chase to his cabin. Danny is cleared of the charges when the wanted man is caught and he convinces Danny to give foster care a try, guaranteeing that Major can stay with him. The film ends with Danny and Napoleon going off on an adventure with Major to find Indians. Napoleon and Samantha was released on July 5th, 1972, and received mostly favorable reviews, but it wasn't a box office success. It was released internationally as a double feature with a re-release of Dumbo. Buddy Baker's score was nominated for an Academy Award. It premiered on The Wonderful World of Color in 1975 and made its home video debut in 1986. Disney strayed from their typical formula with this film, but not too far. It features kids and animals, but the plot is much deeper than usual. While not a comedy, the film does feature the now-cliche chase sequence as its climax. Overall it's enjoyable, but the film suffers from pacing issues and is very slow to start. Michael Douglas and Jodi Foster both give wonderful performances. The clown in the film plays a flittering song on his flute, which is a modified version of "You Can Fly" from Peter Pan which can be heard at the end of the Disney Parks attraction Peter Pan's Flight. Jodi Foster recalled a terrifying experience during this film in an interview on the Freaky Friday DVD. The lion picked her up and shook her like a rag doll during a take, leaving Foster with permanent scars on her stomach and back, plus a lifelong fear of cats. Foster and Johnny Whitaker costarred in MGM's musical version of Tom Sawyer the following year, which was co-written and featured music by the Sherman Brothers. Napoleon and Samantha is currently available on DVD, which features a restored print done in 2004 and is presented in widescreen (1.85:1 instead of the theatrical ratio of 1.75:1). There are no bonus features on the disc. This restoration looked amazing in 2004 compared to the way the other live-action catalogue films from Disney looked. This same restoration is available in HD through iTunes, which exhibits more detail than the DVD version. But in comparison to the newer HD remasters that are available digitally, this one exhibits many more white specks and dust. Walt Disney Productions had adapted many great novels to the screen that had been previously made by other studios. In that respect, you could say that when Walt made his version of Treasure Island, Robin Hood, or 20,000 Leagues Under the Sea they were all remakes. However, the first all-out remake the studio ever did was in 1972 with The Biscuit Eater. It was a short story by Bill Street that published in 1939 in The Saturday Evening Post. Paramount made a feature-length film version in 1940, which is considered the first "sleeper hit" because it cost little to make, had no big stars, but was a big success at the box office. While it was made thirty years earlier, the original was frequently shown on television. So modern audiences in the early 70's would have been familiar with the story. Disney's screenplay was written by Lawrence Edward Watkin, who retired shortly after. His other Disney writing credits include Treasure Island and Darby O'Gill and the Little People. Director Vincent McEveety took on a more serious endeavor than Million Dollar Duck with this film. Johnny Witaker was a familiar face from TV's Family Affair when he was cast in his first of three Disney films. He is the only actor in this film that would become a familiar Disney face, although audiences would have also been impressed by Lew Ayres, star of the famous Doctor Kildare series at MGM. He fell out of favor in Hollywood after being vocal about his displeasure in being drafter for World War II. 1972 was an interesting time for the Walt Disney Company. Roy O. Disney passed away at the end of 1971, just months after Walt Disney World opened. His second in command, Donn Tatum, took over as chairman and CEO of the company while his son Roy E. Disney remained an executive. The Sherman Brothers steared clear of the studio after Bedknobs and Broomsticks because it had become a much different environment than they experienced when Walt was alive. They didn't have to look far for the next studio songwriter, Shane Tatum (Donn's son) wrote his first song "Moreover and Me" for this film and sings it as well. The film begins with footage of Lonnie and his dog playing while the theme song plays. Lonnie's been trying to teach his dog how to point to help him hunt, but the dog is too smart and spoiled to do it. Lonnie's dad forces him to give the dog to the local gas station owner. Behind his dad's back, Lonnie convinces his best friend Text to take the dog and they name him Moreover. The boys train him well, but the dog's desire to eat eggs gets him into trouble when he sneaks into a neighbor's yard and almost gets shot. They enter Moreover into a competition where he competes against the dog Lonnie's dad trained. Moreover would have won, but Lonnie called him the name he hates ("biscuit eater") to make the dog run off fearing his dad would lose his job as a dog trainer if he lost. The boys lose the dog and their mean neighbor poisons him, but thankfully he survives and the film ends with a promise to enter him in next years' competition. The Biscuit Eater was released on March 22nd, 1972. Unlike the 1940 version, critics downgraded it to just another film about a boy and his dog and didn't see much heart in it. Audiences, perhaps because the original was available on TV in reruns, didn't flock to the theater to see it. It made its Wonderful World of Color debut in 1976 and surprisingly wasn't released on home video until 2002, when it was released simultaneously on VHS and DVD. While mostly entertaining, the biggest problem with The Biscuit Eater is that it's not very memorable. It never tugs at your heartstrings, but it has good pacing and an appealing cast. It also deserves to be applauded for having a racially diverse cast, something that was fairly rare for Disney films. It's the second Disney film to have an African American lead actor (the first was Song of the South way back in 1946). It's never stated and isn't immediately obvious, but the film is supposed to take place in the 1930's. You can tell if you pay close attention to the appliances, automobiles and the fact that nobody has a television set. This is definitely a film from a different time where the boys have a rifle and use it while hunting unsupervised. However, gun safety is at least brought up in a scene soon after the boys acquire the rifle. While the dog is often called a "biscuit eater" as an insult, he never once eats a biscuit in the film (only eggs). The dog who plays Moreover was a German wire-haired pointer named Ralph Von Wolfgang. He belonged to a tree trimmer who worked at Disney's Golden Oak Ranch, where most of the movie was filmed. The Biscuit Eater is currently available on DVD where it is presented in fullscreen with occasional dust and excess grain in the print. A more recent restoration was done and is available digitally on iTunes. The film looks much better now, but still has some imperfections. When Mary Poppins was in preproduction, Walt Disney put everything on hold while he waited for P.L. Travers to finalize the film rights. Fearing that they wouldn't get the rights, Walt had a backup plan. Bedknobs and Broomsticks was a book by Mary Norton he purchased in case Travers held out. He assigned the same story team and the Sherman Brothers to adapt it into a film. However, they didn't get too far before finding themselves back to work on Poppins. After Walt passed away, the studio began to work on many projects that Walt either didn't get to or had passed up. Yearning to recapture the success of Mary Poppins, the Sherman Brothers found themselves back at the studio to finish Bedknobs and Broomsticks. One of the new songs written was "The Age of Not Believing," which was inspired by the brothers' doubtful feelings of pulling off the picture without Walt. In addition to the songs written specifically for this film, they also recycled a deleted song from Mary Poppins called "The Beautiful Briny Sea." The same story team from Poppins returned to finish the script, Bill Walsh and Don DaGradi. However, the studio forced an animated soccer match into the script that they objected to, which was written by Ralph Wright and Ted Berman. Robert Stevenson, who directed Mary Poppins, directed this film as well. Ward Kimball directed the animated sequences. Julie Andrews was the first choice to play the lead, but she turned it down. Angela Lansbury, who was originally considered to play Poppins, was cast instead. David Tomlinson from Mary Poppins was cast opposite her. Roddy McDowell is another familiar Disney face, having appeared in That Darn Cat and The Adventures of Bullwhip Griffin. Production took place mostly at the Disney Studio in Burbank. Exterior sets were built on the backlot while the sound stages were filled with the massive Portobello Road set. A few shots required a second unit to travel to England. When production wrapped, the film was over two hours long, which caused most movie theaters to refuse to show it. Roadshow musicals were quickly falling out of favor by 1971 and Radio City Music Hall wanted to book the film, but needed it shortened to include their Christmas stage show on the same program. Twenty-five minutes of the film were cut for its original theatrical release. The film opens with a tapestry-inspired credit sequence. Eglantine Price is an apprentice witch who is forced to take three children into her care during World War II. After the kids see her flying on a broomstick at night, they threaten to reveal her secret to improve their living conditions. Instead she compromises, enchanting a bedknob to take them wherever they want. Their first stop is to find Professor Brown in an attempt to get the final spell from her correspondence course. It turns out the professor only had half of the book. They track down the other half in Portobello Road, but find that the most important page is missing. In a daring escape from a thug, they flee to the island of Naboombu, which is inhabited entirely by animals bewitched to behave like humans. King Leo on the island has the final spell Eglantine has been waiting for, which she uses to enchant an army of empty armor to scare the nazis out of England. 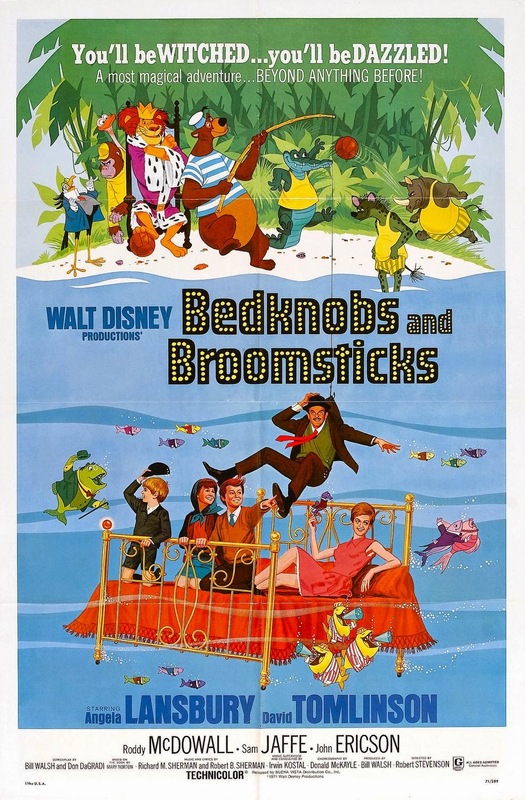 Bedknobs and Broomsticks had its world premier on October 7th, 1971 in London. It debuted in theaters on December 13th, 1971. Critics were mixed on it, most comparing it to Poppins. It made $17 million at the box office, but cost an estimated $20 million to make. However, the studio decided to rerelease it in 1979, although they edited it further to just 98 minutes. It made its home video debut in 1980. In 1996, the studio attempted to restore the film to its original length. The footage for one musical number ("A Step in the Right Direction") couldn't be found and some audio elements had to redubbed because the original audio elements were destroyed. It would be impossible to top Mary Poppins and Disney learned this the hard way with Bedknobs and Broomsticks. However, it's still a very enjoyable film. The Sherman songs are mostly great, but none of them tug at the heart the same way "Feed the Birds" does. Angela Lansbury is marvelous here as well and was nominated at the Golden Globes for her performance. Like Poppins before it, the Academy of Motion Pictures Arts & Sciences nominated the film for a slew of awards, including Best Song ("The Age of Not Believing"), Best Costume Design, Best Score and Best Art Direction. It took home the award for Best Visual Effects. Comparing the theatrical cut to the extended version, I actually feel the theatrical cut makes for a better film. It has much better pacing and doesn't lose any major plot elements. Bedknobs and Broomsticks is currently available on Blu-Ray in widescreen (1.66:1 instead of the correct 1.75:1). The film looks amazing in high definition and is presented in its original theatrical cut (117 minutes). The deleted scenes and songs are available as bonus features. However, if you want to see the extended version that was restored in 1996, you'll have to buy the "Enchanted Musical Edition" DVD (the DVD included with the Blu-Ray is the theatrical cut and loses most bonus features). The same restoration found on the Blu-Ray is available digitally on iTunes, which also includes all of the bonus features. 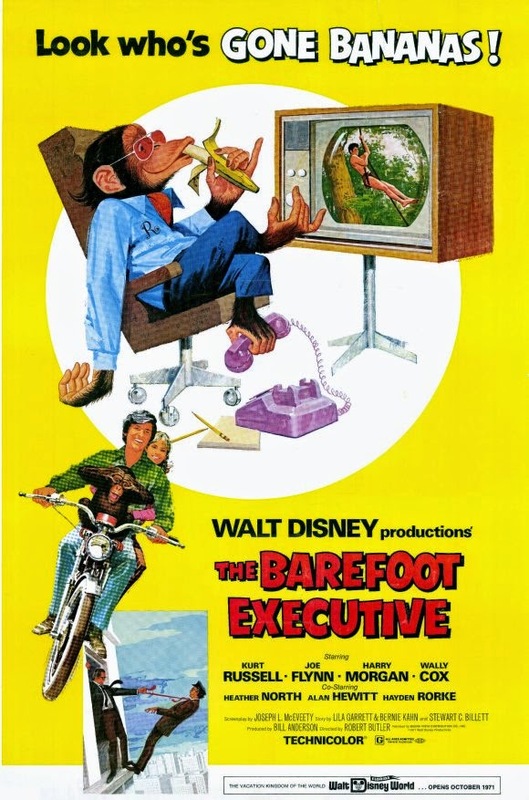 Walt Disney Productions' zany comedy for 1971 drew inspiration from Aesop's Fables. The Goose That Laid the Golden Eggs inspired Million Dollar Duck. Using a familiar formula and familiar faces, Disney seemed to be playing it safe with this film. Director Vincent McEveety made his Disney film debut with this film, although he had previously directed three TV movies for the studio (The Ballad of Hector the Stowaway Dog, Smoke and Menace on the Mountain). The story was created by Ted Key, who would go on to write other Disney films including The Cat From Outer Space, with a screenplay by Roswell Rogers. Dean Jones was cast in the lead role, his first Disney project since The Love Bug three years prior. Sandy Duncan was not yet a household name when she was cast as his wife (she went on to have her own TV special filmed in Disneyland). Other familiar Disney faces include Joe Flynn (The Love Bug, The Computer Wore Tennis Shoes) and Atrhur Hunnicutt (A Tiger Walks). An open casting call was held for the duck, with Webfoot Waddle winning the role. He enjoyed weekends off floating in the studio pond during production. Most of the film was shot on the Disney lot, with residential street as the main backlot setting for exterior shoots. The farm set appears to be Disney's Golden Oak Ranch and there is also quite a bit of shooting around the greater L.A. area. The film begins with an animated title sequence where the duck keeps bringing eggs to the bottom of the screen. Albert Dooley is a scientist with money problems. When his boss decides to get rid of a lab duck, Albert takes it home. But after the duck ate his wife's weird apple sauce and was exposed to radiation, the duck begins laying eggs with a golden yolk. When Katie begins to spend the eggs, the government gets on their trail and spies on them. When Albert's son runs away with the duck, it becomes a race against the feds to get them back. 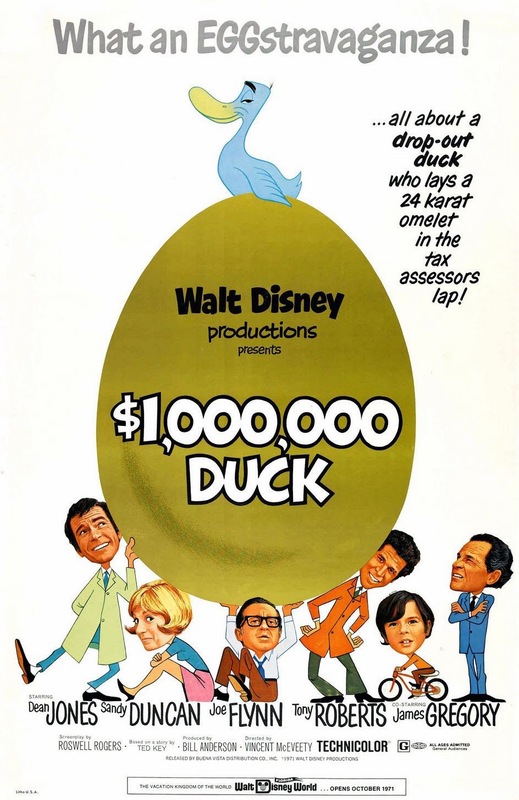 Million Dollar Duck was released on June 30th, 1971. Critics bashed the film, which was reportedly one of only three movies that Gene Siskel ever walked out on. It didn't cause much of a sensation at the box office. It debuted on The Wonderful World of Disney in 1974 and was released on home video in 1986. I've read several reviews of this film from various blogs and they all unanimously hate it, but I can't understand why it deserves such scathing reviews. Dean Jones and Sandy Duncan are delightful in this. Sandy Duncan was even nominated for a Golden Globe for her performance in this film. Is it dated? Very much so. Duncan's character is a dumb-as-rocks housewife stereotype and there are a few racist elements to the film as well, although nowhere near as bas as in The Boatniks. But when viewed through a nostalgic lens as a reflection of the time in which it was created, Million Dollar Duck is fairly enjoyable. It has a heartfelt message about not letting money destroy relationships and the formulaic chase is fun with the addition of Dean Jones (and a mannequin stand-in) riding through L.A. on a raised cherry picker. Million Dollar Duck is currently available on DVD, where it is presented in fullscreen. The presentation is an open matte VHS master that features dust, scratches and excess grain. A more recent restoration was done that is available digitally in HD on iTunes. That version is in widescreen 1.66:1 (correct aspect ratio would 1.75:1). Scratches and dust have been removed from this version and the film looks much better in HD. 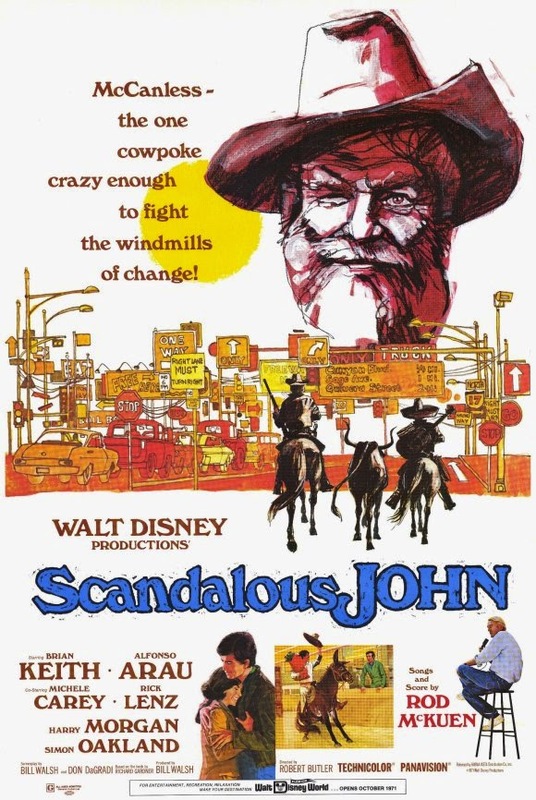 It may be surprising to modern audiences that Disney produced many Westerns throughout the 50's, 60's and 70's. They were sometimes more family friendly and silly like The Adventures of Bullwhip Griffin, but could also be quite serious and mature like Smith!. However, for all of their efforts their only true success with the genre was on television and neither Walt, nor the studio that he left behind, ever came close to matching the success of Davy Crockett. The Wild Country falls in the more serious category. The film is based on a book called Little Britches: Father and I Were Ranchers by Ralph Moody, which was an autobiographical tale from when he was eight and was the first in a popular series. The screenplay was written by TV writers Calvin Clements and Paul Savage. Director Robert Totten was hired to direct, who was also specialized in TV and had done a few TV movies for The Wonderful World of Disney. Steve Forrest took top billing, who also played the dad in Rascal. But the most recognizable Disney star of the era was Vera Miles (Those Calloways, Follow Me Boys). Ron Howard, still known here as Ronny Howard, plays their eldest son and his brother Clint Howard plays the youngest. Their father Rance Howard has a cameo in this film, making it the first theatrical film they all appeared in together. Filming took place entirely on location in Jackson Hole, Wyoming, which is also the setting of the story. Filming took place in the summer of 1970 over a seven week span. Seven wind machines were brought there from Walt Disney Studios and were used in combination with three snowplanes to create the tornado that appears on screen. 80 acres of greens had to be painted tan to give the illusion of drought. The film begins with a stagecoach traveling through the country as the credits play. The Tanner family have moved from Philadelphia to Jackson Hole, Wyoming, to start a new life for themselves. However, they quickly find that their new home is broken down. They make the best of their situation, but things get even more complicated when they find out their neighbor, Ab Cross, has cut off the water supply to their farm. Jim, the father, attempts to establish rules in lawless Jackson Hole, a struggle that proves harder to do than it seems. They reach yet another setback when their home is damaged by a tornado. Just as they are about to give up, a court order arrives to legally settle the dispute with Ab Cross. In retaliation, he has their barn set on fire and when the family tries to put it out, Ab tries to shoot them. Eldest son Virgil steps in at the last second with a rifle to save the family. After his death, Ab's men step up to help the family rebuild their barn, feeling guilty for the part they played and the story ends on an optimistic tone for the future. The Wild Country was released on January 20, 1971. The movie poster advertised that Walt Disney World would be opening that October. Critics were generally positive, praising the pacing and chemistry between the family actors. However, it was not a big draw and didn't do much at the box office. It made its TV debut on The Wonderful World of Disney in 1975 and was released on home video in 1986. For a Disney film, The Wild Country is surprisingly violent and intense. But perhaps an even bigger surprise, it's a really great film. There are several scenes of hand-to-hand fighting with a bit of blood and the tension between the Tanner's and Ab Cross is much greater than your average Disney film. There are a few moments reminiscent of Old Yeller, particularly Clint Howard's character who is basically Arliss (always trying to catch animals, desperate to get a dog). There are also plenty of scenes of the family interacting with wildlife, including the birth of a filly. While this was Ron Howard's only on-screen role for Disney, he would have a great impact on the company with his directorial debut Splash in 1984, which launched Disney's less-family oriented division Touchstone Pictures. 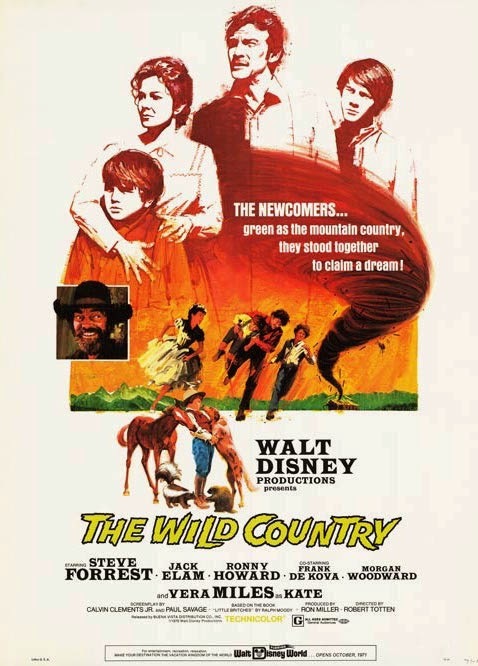 The Wild Country is currently available on DVD as a Disney Movie Club Exclusive. The film is presented in full screen and is believed to be the original VHS master. The print has quite a few scratches and dust artifacts and the colors seem faded. There aren't any bonus features. This same version is available digitally from all major digital providers. It is one of the few Disney films that hasn't received a more recent HD restoration.